AS3 closures are basically inline functions you write as objects. You pass them around as parameters to other functions and have fun. Like C# lambdas, but a bit more constrained from what I understand due to scope problems. They are not like "real" LISP lambdas, as you can't build code as data. I use TweenMax by Greensock. Rogue Survivor made me fall in love with closures/lambdas, and while they are quite an un-OOP way to do things, I tend to use and abuse them. I like having different concepts available in one language. In AS3, I found they are highly useful to coordinate logic, interface and animation(tweens). For instance, here's the current code to make a pawn perform a movement action by following a path. movePawn() performs a single move. As the pawn sprite is moved with a tween, the move happens over several frames. The callback onDone is called when the move is completed. doMove() implements the move action. 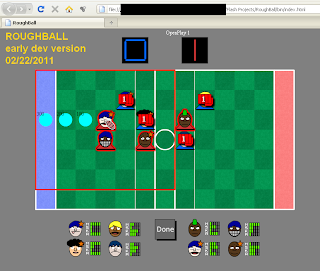 The process is controlled by the nextStep closure which call movePawn to make a single move step when appriorate, grab the ball, check for TD and end the move. Since a closure is a function, it can call itself if needed (recursion) or pass itself as parameter to another function. It asks movePawn to perform a step and register itself as a callback, to resume the movement when a move step in completed. Remember all this happens over several frames, without needing to explicitly write it in code, as everything ends up linked to the tween engine which handles it for you. Basically you can think of it as a thread without having the hassle to write thread specific code. Coordinating logic, animation and user input has always been a headache or a chore for me and I love how Flash makes it so easy. In another part of the code I use different paradigms. A classic State Machine for the main match flow (phase and subphases). And a weird thing I made up to control the game flow that also make use of closures by basically building "scripts" of closures at runtime, kinda like you would write CONS lambda code on the fly in LISP. I might describe it later(**).